I came across these two Redback Salamanders (Plethodon cinereus) while digging a shallow trench in a forest in Cuyahoga County, Ohio. They were about 10 cm (~ 4 inches) underground, together in a small cavity. 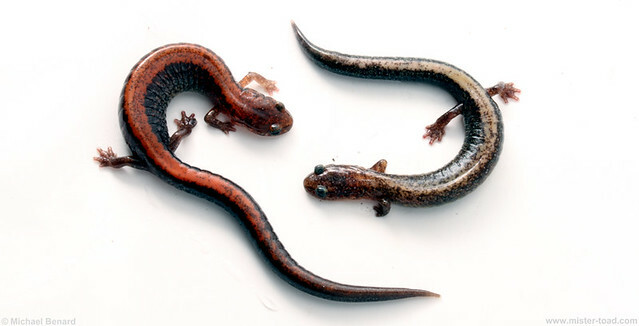 Redback Salamanders are incredibly abundant in eastern North American forests. But because of the Redback Salamander’s subterranean habits, most people spending time in the woods are unlikely to see them. Female Redback Salamanders also guard their eggs, until they hatch into tiny, baby salamanders. This entry was posted in Natural History, Photography and tagged Ohio, Redback Salamander, Salamander, Variability. Bookmark the permalink.